The cover illustration of this book — the title words at the bottom of a dark empty box — struck me as odd until I started reading. The story documents, in personal and societal terms, the suffering and costs of psychosis in America today. As I read, I realized the illustration is a metaphor for the profound isolation of people with serious mental diseases. Author Ron Powers (“Flags of Our Fathers,” “Mark Twain: A Life”) has switched from his third-person perch to write a book that is personal and historical and somewhat clinical. He and his wife, a scientist, raised two bright sons, each of whom developed schizophrenia in late adolescence. Early on we learn that one of the sons hanged himself and died alone in the family basement one night, only to be discovered the next morning by his father. This is powerful and painful stuff, but Powers uses it to good effect, talking about the boys’ joyful early years and then the parents’ discoveries that their children’s thinking had strayed from reality. Interspersed with the family tale are historical recounts of how people who are different have been treated through history, particularly in the U.S. since about 1960. I always had heard that insane asylums began to be shut down in latter part of the 20th century. Powers explains how and why it happened. First, he says, the FDA approved Thorazine, the first drug for treatment of psychotic disorders, for use in the U.S. in 1954. This was a perhaps naive period. After the introduction of antibiotics and the polio vaccine, Americans may have believed that science soon would yield treatments, or even cures, for every imaginable disease or disorder. Unfortunately, Thorazine wasn’t a magic bullet. Its effect, making more dopamine available in the body, did not address the causes of mental disease. It also had unpleasant side effects: dizziness, drowsiness, anxiety, sleep problems, weight gain, swelling of hands and feet, blurred vision and, worst, permanent involuntary tics and muscle twitches. No matter. Within 10 years, 10 million Americans were taking Thorazine. Then came lithium and many other anti-psychotic medications. Some are helpful, but each case of mental illness is unique, activated by different brain reactions as well as individual life events and stresses. Then, in 1961, psychiatrist Thomas Szasz published a groundbreaking book “The Myth of Mental Illness” that questioned the legitimacy of his field and provided intellectual cover for generations of anti-psychiatry activists, including L. Ron Hubbard, the sci-fi writer who founded the Scientology religion or movement or whatever it is. All this noise about magic medications and individual freedom caused legislators and insurance companies to de-institutionalize masses of psychotic people. Over time and as the national population increased — by more than 100 million between 1960 and 2000 — the number of beds for psychiatric inpatients declined by 95 percent. Since then, we have not created the promised small group homes or communities that would have offered refuge and, ideally, steady support for psychiatric patients to live more independent lives. Jails and prisons, stressful places for all but particularly for the emotionally fragile, now have replaced insane asylums as the institutions that house our largest populations of psychotic people. The asylums may have been bad, but the prisons are more expensive and much, much worse. As Powers winds up his book, he introduces a term that I had not encountered before: anosognosia. Anosognosia is the diagnosis when a sick person is unaware that he is sick — not in denial but detached utterly from reality. Powers tells of receiving a phone call early one morning from a son who announced that he had received a great honor in the middle of the night and that he was on his way to pick up his prize. The parents, heroically committed always (and who wouldn’t be? ), scrambled to intervene. This was not the first time one of their children needed such help. 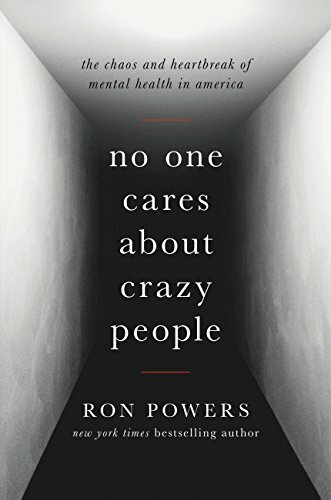 It is not unusual for psychotic people, once stabilized on medications, to become convinced their medicines are no long necessary and to stop taking the medicines; the resulting deterioration in their situations is challenging even for those with fully involved families and well-organized support systems. Powers applies the word in a broader sense. As a country, he suggests, we also suffer anosognosia. We willfully ignore the problems suffered by people whose brain chemistry is causing them great pain. His book is a scream for his children and for others like them, a scream to the rest of us to take these matters seriously.